The Miagao Church also known as the Santo Tomas de Villanueva Parish Church is a Roman Catholic church located in Miagao, Iloilo, Philippines. The church was declared as a UNESCO World Heritage Site on December 11, 1993 together with San Agustin Church in Manila; Nuestra Señora de la Asuncion Church in Santa Maria, Ilocos Sur; and San Agustin Church in Paoay, Ilocos Norte under the collective title Baroque Churches of the Philippines, a collection of four Baroque Spanish-era churches. 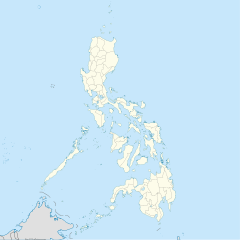 Miagao was formerly a visita (a locality served by a visiting priest) of Oton until 1580, Tigbauan until 1592, San Joaquin until 1703 and Guimbal until 1731. It became an independent parish of the Augustinians in 1731 under the advocacy of Saint Thomas of Villanova. With the establishment of the parish, a church and convent was built on land near the sea called Ubos. Father Fernando Camporredondo served as the town's first parish priest in 1734. When the town experienced frequent Moro invasion in 1741 and 1754, the town moved to a more secure place. From there, a new church was constructed in 1787 through forced labor under the supervision of Fray Francisco Gonzales, parish priest and Spanish gobernadorcillo Domingo Libo-on. It was built on the highest point of the town to guard from invaders called Tacas. After ten years, the church was completed in 1797. It was designed with thick walls to serve as protection from invaders. It was severely damaged during the Spanish revolution in 1898 but was later rebuilt, fire in 1910, the second World War and earthquake in 1948. The present day Miagao church is the third church built since its establishment in 1731. To preserve the church, it underwent restoration in 1960. This was completed in 1962. It has been declared a national shrine through Presidential Decree No. 260. The church's over-all architectural style falls under the Baroque Romanesque architectural style. Its ochre color is due to the materials used in constructing the church: adobe, egg, coral and limestone., The church's foundation is 6 meters deep and the massive stone walls at 1.5 meters thick are intensified through the use of 4 meter thick setback buttresses as protection to the Moro invaders as stipulated under Royal Decree 111 of 1573 (Law of the Indies). Above the wooden door entrance at the center of the façade just below the image of St. Christopher is a carved image of the town's patron saint, St. Thomas of Villanueva. At each side of the door is the images of St. Henry of Bavaria on the left and Pope Pius VI., Above the images of St. Henry and Pope Pius VI is their respective coat-of-arms. The two huge unequal belltowers  directly attached to the main churchserve as watchtowers to defend the town against invasion of Moros. It has two different designs since it was commissioned by two different priests. On the left side is the older belfry, the tallest west belfry with four levels. Originally, the east belfry was constructed only with two levels. It was in 1830 when Father Francisco Perez decided to add another story to the east belfry. Until now, the east belfry (three levels) is one level shorter that the west belfry (four levels). The original late 1790s images of St. Tomas of Villanova can also be found enclosed in a glass case in the rear side of the church. ^ a b c d "Baroque Churches of the Philippines". Retrieved June 25, 2014. ^ "Miag-ao Church". Retrieved June 26, 2014. ^ a b c d e "Miag-ao church is an architectural treasure of Iloilo". July 21, 2011. Retrieved June 26, 2014. ^ a b c d e "A UNESCO World Heritage Site, Miagao's Church of St Thomas of Villanueva". Retrieved June 26, 2014. ^ "7 Must-See Churches in Iloilo". March 25, 2013. Retrieved June 26, 2014. ^ "The Baroque Fortress Church of Iloilo: Miag-ao". Retrieved June 26, 2014. ^ "Miagao Church". Official Website of the Municipality of Miagao. Retrieved June 26, 2014. ^ "The Historical Miagao Church in Iloilo". August 1, 2013. Retrieved June 26, 2014. Wikimedia Commons has media related to Miag-ao Church. This page was last edited on 13 February 2019, at 15:28 (UTC).